Collaborative Justice Courts offer an alternative to the traditional judicial system. California is home to more than 400 collaborative justice courts, or problem-solving courts, which offer treatment-based services in lieu of incarceration to people who’ve committed low-level criminal offenses. More than half of the state’s 58 counties have four or more types of collaborative courts, including veterans, drug, and DUI courts. 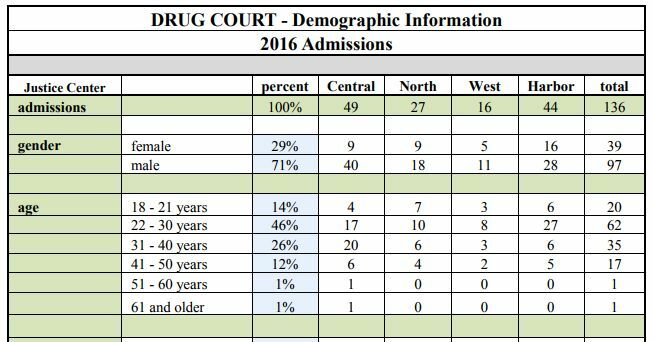 Orange County's Drug Court statistics. California established its first collaborative court in 1991 and since then, the number of the rehabilitation-focused courts have grown exponentially, improving judicial system outcomes and communities by addressing underlying problems such as mental health and substance use disorders. The Superior Court of Orange County, one of many counties that have several collaborative courts, recently published its 2016 Annual Report on Collaborative Courts, which detailed the court’s effectiveness, including reduced recidivism rates and cost savings of more than $11 million. To learn more about collaborative courts, visit http://www.courts.ca.gov/programs-collabjustice.htm.